There’s another famous on Instagram now. 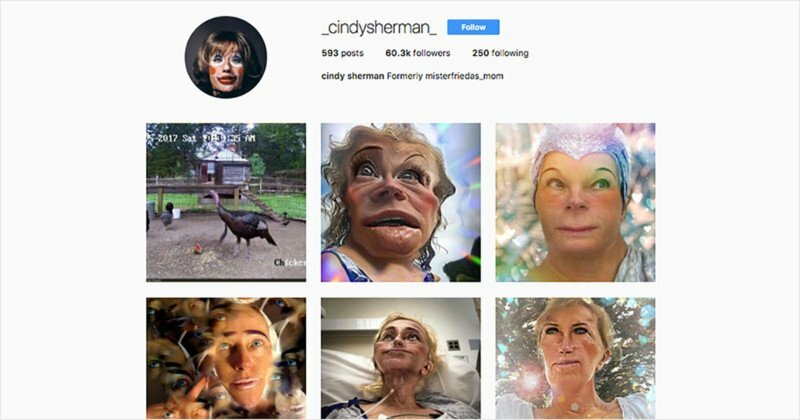 Cindy Sherman is now sharing her unusual photos on the platform, and her account has already attracted over 60,000 followers. Sherman is an American photographer who’s known for her conceptual portraits. She received a MacArthur “Genius Grant” in 1995. Several short years later, her work began setting auction records. In 2010, a print of a Sherman photo titled Untitled #153 sold for $2.7 million, making it one of the priciest photos ever sold at the time. In 2011, her photo Untitled #96 sold for a staggering $3.89 million, becoming the most expensive photo ever sold at the time. artnet News spotted the 63-year-old photographer’s new public account and writes that Sherman now seems to be using the digital platform to share photos that were once exclusively displayed on gallery walls. “Not only does this provide a generous look into her process for her fans, it also raises the question: Is Cindy Sherman using Instagram to make new work?,” artnet writes. Sherman’s account, @_cindysherman_, contains a mix of personal snapshots shared alongside manipulated artistic portraits. Some appear to be the result of Apple’s Photobooth-style filters. Other photos she has shared are more mundane — things like a caged turkey, a snapshot of some hospital food, and kids bored at a dinner party. The account has about 600 photos at the time of writing. If you’d like to follow along with Sherman’s Instagram photos and peek inside the life and mind of a world famous photographer, head on over to her account and give it a follow. Samsung Chromebook Plus vs. Pro: The Differences and Which Should you Buy?